Knowing the price for this, it is indeed great and stylish. Not to mention comfortable. For outings, I can totally work this out. It doesn’t look that simple that I’m going to make it as my everyday wear. I can make myself look good wearing this in front of my girl. When coming to this, it’s the same thing as you get what you pay for, but I believe the price should be reduced even lower so other cool guys like me can afford it. Anyway, it’s one of my favorites attires. Fan Jackets have done a great job by making the exact match of the jacket. I’m a big Tom Cruise follower, and his movies and this jacket fully resemble the film version. And it’s really a fine everyday wear. Have a stylish appearance for everyone to admire. 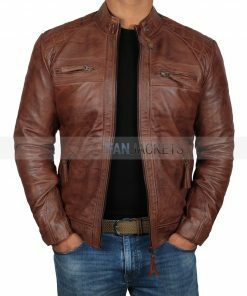 Get the finely crafted Jack Reacher Jacket that is spotted in the Hollywood movie, Jack Reacher. Tom Cruise wore this outfit as the titular hero. The Tom Cruise Leather Jacket is prepared from the real leather, making it a durable outerwear for you. A collar style, which has been preferred as the trend in casual fashion, is featured on the jacket. Pockets on the outside and inside give you enough space to keep your belongings. 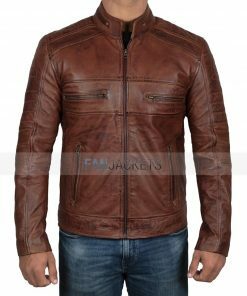 Simple open hem cuffs complete the look of the Jack Reacher Leather Jacket. Make this part of your everyday wear by ordering now.